Maoism is growing in India, Nepal and the Philippines. There are also strong movements in Turkey, Afghanistan, Iran, Sri Lanka, Bangladesh and several other Asian, African and European countries plus nearly all of the Americas. Some operate inside the Revolutionary Internationalist Movement, which supports Peru's Sendero Luminoso, others are aligned to more generally focussed, Maoist Internationals. Sendero Luminoso, decimated after the 1992 arrest of its leader Abimael Guzman (Gonzalo) is making a slow comeback. 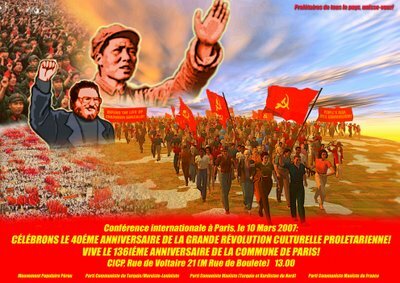 Recently in Paris, several Sendero Luminoso supporters, the Peru People's Movement, the Communist Party of Turkey (Marxist-Leninist), the Maoist Communist Party (Turkey and North Kurdistan) and the Maoist Communist Party of France organised a conference to celebrate one the great periods of Maoist history, the Chinese Cultural Revolution. Thus, the celebration of this anniversary of the GPCR is a renewal of our promise to never lay down our arms until communism, a promise that falls upon all the communists of the world; and therefore, the celebration also serves the reconstitution of the Communist Parties as militarized Marxist-Leninist-Maoist communist parties, that initiate and develop people´s war in all the corners of the world, as soon as possible; in this way it also serves to support the communists in Nepal, see the complex situation that the Communist Party of Nepal (Maoist) faces and reaffirm that for the international proletariat and the oppressed peoples of the world, for all the communists, revolutionaries and progressives of the world, there is no other option than to culminate the democratic revolution through the conquest of power in the whole country, by way of the guns of the revolutionary army. We Maoists are supporters of the omnipotence of the revolutionary war and among us no one, whoever it may be, can let themselves move even an inch from the course that is guaranteed by two principles: "Political power grows out of the barrel of a gun" and "It is right to rebel! ", the only proletarian, people´s and democratic road, the road of the people´s war. We will hold the Second International Conference to Celebrate the 40th Anniversary of the Great Proletarian Cultural Revolution on March 10th, 2006, in Paris. Paris, which was the birthplace of the proletarian dictatorship, the first time we seized power. 136 years ago the heroic proletariat of Paris and spilled their blood and constituted the Paris Commune. The great Lenin said: "The sacrifices of the Commune, heavy as they were, are made up for by its significance for the general struggle of the proletariat: it stirred the socialist movement throughout Europe, it demonstrated the strength of civil war, it dispelled patriotic illusions, and destroyed the naïve belief in any efforts of the bourgeoisie for common national aims. The Commune taught the European proletariat to pose concretely the tasks of the socialist revolution. The lesson learnt by the proletariat will not be forgotten." New Zeal Look to a big upsurge in Maoist violence this year and growing evidence of Maoist/Muslim cooperation. I thought these people were anti-war? Oops, only if the war is waged by the West. Your blog's looking good MAH. Thanks. Take a look at the latest entry of the flag burning and U.S. soldier effigy burning. Wonder if these folks wouldn't mind lining up with the soon-to-be-Soviet-Russian dictator-Oleg Shenin. Wonder if Shenin has burned effigies of U.S. soldiers or U.S. flags.